Scoliosis is typically a painless condition that causes an abnormal curvature in the spine. This will often create a rotation of the spine and rib cage, which creates asymmetry of the shoulders, trunk, and waist. Although most cases of scoliosis are mild, severe scoliosis can often be disabling. Certain conditions can help cause scoliosis such as cerebral palsy, but in most cases the cause of scoliosis is unknown. The three main types of scoliosis are Functional, Neuromuscular, and Degenerative. 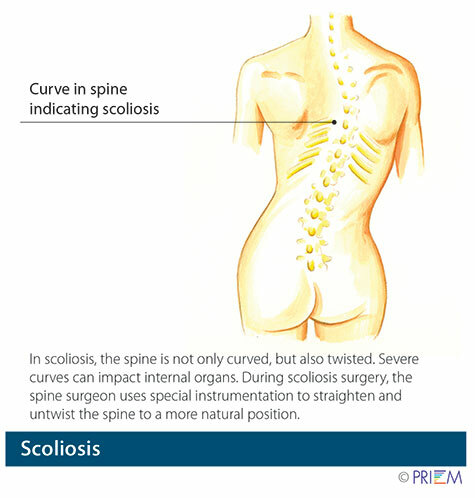 Functional scoliosis is where the spine is normal, but eventually an abnormal curve starts to develop due to another aliment in the patient’s body such as having one leg longer than the other. Neuromuscular scoliosis can usually be much more severe since the condition is present at birth. This type of scoliosis is due to the failure of the spine bones to properly form, or fail to correctly separate from each other. People born with birth defects or cerebral palsy can often have neuromuscular scoliosis. Degenerative scoliosis is found in adults where the weakening of normal ligaments and other soft tissues of the spine can lead to an abnormal curve in the spine. Many times this can be linked to the patient having complained about arthritis. Idiopathic scoliosis is not linked to a known cause, but it is the most common type of scoliosis in adolescents. Doctors are unsure what causes this type of scoliosis, but it is suggested that it is hereditary because the disorder tends to run in families. Most of the time the patient is unaware of the curvature in their spine and is noticed by someone other than himself or herself. The most common symptom of scoliosis is a curve in the spine. 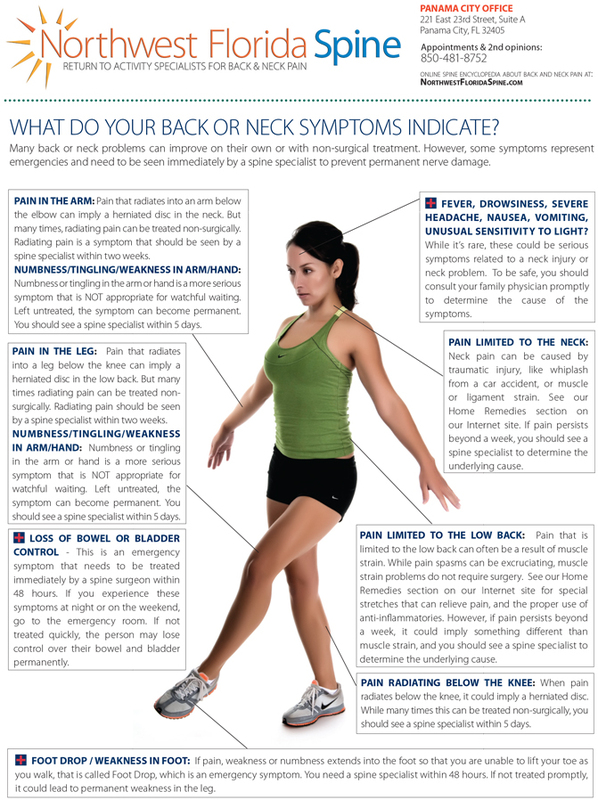 Some of the warning signs to look for are shoulders at different heights, appearance of a uneven waist, rib cages at different heights, leaning of entire body, fatigue, backache, low-back pain and head not aligned with the pelvis. These signs and symptoms typically begin during the child’s growth spurt. Boys and girls develop mild scoliosis around the same rate, but girls have an increased risk of the scoliosis worsening. Severe scoliosis (a curve greater than 100 degrees) can create dangerous problems by making it more difficult to breathe and the heart to pump properly. If there is uncertainty that you or your child might have scoliosis, it is best advised to see a scoliosis specialist to get evaluated. It is not uncommon for pediatricians and schools to conduct routine examinations (Adam’s Forward Bend Test) for scoliosis. This test has the person take off their shirt and touch their toes, which exposes the spine to the examiner so he or she can easily detect any abnormal spinal curvatures. Most of these screenings take place in the fifth or sixth grade. Further testing can be done by taking an X-ray from the front and the side to get a clearer view of the curvature of the spine. Height and weight is routinely measured because the more remaining growth the patient has, the greater potential of the scoliosis to eventually worsen. It is advised to have a follow up examination to compare the results of your previous visits to get a better idea of the pace of the spinal curving. Treatment of scoliosis is individualized and is directly based on the severity of the curve and the potential of the spine developing even worse. 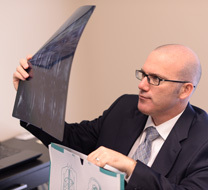 The three main categories of most scoliosis treatment include observation, bracing, and surgery. Observation is usually the most common route. If the doctor recommends wearing a brace, this treatment is designed to further prevent worsening of the curvature in the spine rather than to reverse the scoliosis back to a completely straight spine. Surgery consists of connecting two or more vertebrae in the spine together with new bone using metal rods, screws or wires to maintain a straight posture while the spine heals. Neuromuscular scoliosis is usually the most demanding on aggressive treatment and many of these patients might need surgery. Where is scoliosis treatment going? Experimental testing is being researched to see if a patient’s blood can give doctors insight about if the scoliosis is likely to worsen in the future. The implementation of school examinations for scoliosis helps parents be aware of their child’s situation before a more severe problem eventually develops. Early detection can drastically help the person from maybe needing only observation treatment and avoiding a risky surgery. The vast majority of people diagnosed with some degree of scoliosis will often live normal, active and healthy lives.